This 3-4 days trip takes you from Sipi at 1708meters to Wagagai, the highest peak of Mount Elgon standing at 4321 meters above sea level. You will explore the mountain terrain to enjoy expanses of unique vegetation, breath taking scenery and caves. 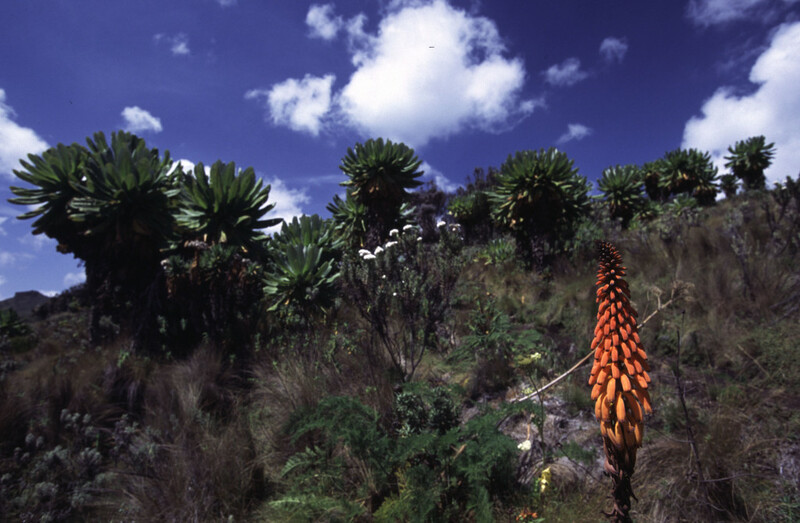 On the trip you will not miss the lobelia Elgonensis, the everlasting flowers and many other eye catching flowers. Common site will be colorful bird and insects, forests and you may also find some primates while in the forest zone. The trip takes four days of trekking plus the two days of transferring to and from the base camp. It is a camping trip and guest can choose to come their own gear. Day 1: JINJA – MOUNT ELGON: Today, you arrive at the base of Mount Elgon. Dinner and overnight at one of the following options: blue star homestay. Robs rolling rock or Crow’s nest campsite. Day 2: PISWA CAMP: After breakfast, with the 4wd car, you will transfer to Kapkwata at 2190 meters above sea level, from where you will start your hike on the Kapkwata Trail. You will be exposed to a very scenic route running through the bamboo, heath and moor land leading you to the Piswa Camp at 2850 meters above seas level. You will have dinner and overnight camping at Piswa Campsite. Day 3: HUNTERS CAVE CAMP: Hike up to the edge of the caldera through beautiful pillars of the most unusual plant species including Lobelia Elgonensis. You will also find the wild everlasting flowers. Visit the hot springs and Suam Gorge as you start to ascend to the Hunters Cave Camp at 3850 meters. Dinner and overnight camping at Hunters Cave Camp. Day 4: MUDE CAVE CAMP: After breakfast, you ascend to the top of the caldera to the Wagagai Peak at 4321 meters. Descend thereafter through the Jackson summit (4200 meter) and the Jackson pool to arrive at Mude Cave Camp at 3500 meters. Dinner and camping at Mude Cave Camp. Day 5: MOUNT ELGON – KAMPALA: Early morning, descend through the Sasa trail to Budadiri and then travel back to Mbale town. You will have lunch in Mbale and head to the next destination. Full board (Meals and energy).